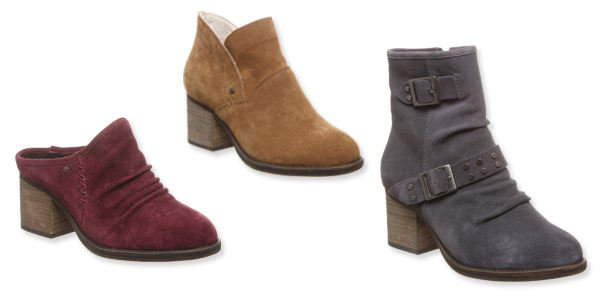 This season is all about chunky heels, and BEARPAW has you covered with options that will give your style a lift with chic, stacked woodgrain heels. And we love that these selections are treated with NeverWet, a superhydrophobic technology that repels stains from liquids and cleans dirt and debris easily with water! 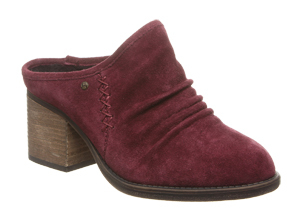 It’s the perfect go-anywhere mule, designed with a ruched vamp, curved topline, and stitch accent in rich cow suede. It’s lined with sherpa fleece for that extra comfort and warmth. $99.99. It’s the perfect addition to your wardrobe. 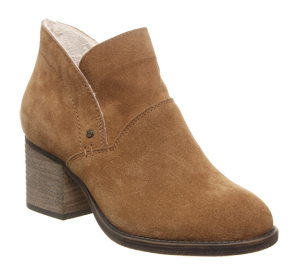 This tulip-shaped topline bootie has a cow suede upper, sherpa fleece lining and footbed lifted on a sturdy wood-grain heel with textured rubber sole for added traction. $99.99. 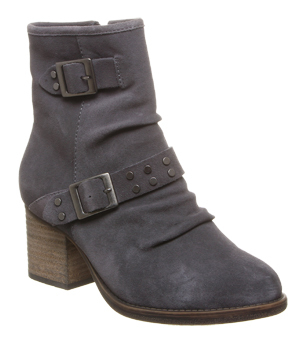 Metal studs accent this 6” boot crafted in cow suede with a ruched vamp for an updated moto-chic look. It has a medial side zipper for easy on and off, and is lined in cozy Sherpa fleece. $124.99. For more great selections and to get your own pair delivered to your door, check out BEARPAW online!